Carte Blanche, the new James Bond novel written by Jeffrey Deaver, has James Bond choosing Warwick’s ‘Three Cape Ladies’ Cape Blend to accompanyhis seduction of Felicity Willing. Three Cape Ladies is a delicious Cape Blend of Cabernet Sauvignon, Pinotage, Merlot and Shiraz. Some interesting comments about Pinotage from Neal Martin who was one of the international judges at this year’s Old Mutual Trophy Wine Show. Neal Martin is a Bordeaux expert and one of Robert Parker’s team. This was his first visit to South Africa. 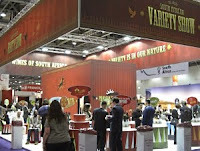 “South Africans love Pinotage like English love fish and chips and we know that fish and chips is never going to be the top sashimi in Japan but we still love it and we’re still proud of it and we’ll always keep eating it. “I have to say when we had the ’61 Pinotage it completely blew me away. It was as exciting as any extremely expensive wine I’ve had because it completely changed my perception and opened my mind. The month before I’d tasted half a dozen ’61 Bordeaux and it was just as enjoyable, if not more so than those. We had a half bottle of ’59 Zonnebloem. One of the things that was interesting was that a couple of people said where did we lose our way. If we can make that in ’61 why are we getting such bad press now, which I thought was really interesting. Koopmanskloof is a winery new to me. 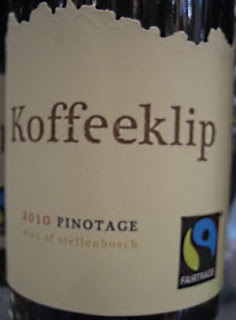 Anriënka (call me Anna) Vlok told me it is in the Bottellary Hills where the soil type is a shale known as Koffieklip which proved to be a convenient name for their new coffee toned Pinotage. I thought the coffee tones were very muted in this tank sample and I wouldn't have identified this as a 'coffee style' Pinotage if it wasn't for the name. It's a pleasant modern berry fruited wine with - yes - maybe some coffee lurking in the background, but this is a sample and it will be interesting to taste the finished wine. The bottle in the film has a temporary label but the actual - rather attractive - label is shown below. I noticed a new wine with an oak coloured label on Rijk's stand at this year’s London International Wine Fair: Rijk’s Touch of Oak Pinotage. Winemaker Pierre Wahl was happy to tell us about this addition to Rijks range of Pinotage wines. If found the wine pleasantly fruit forward with the oak well hidden and was surprised when Pierre said it had spent 14 months in oak, but old barrels. That’s how oak should be, supportive but not overt. I think Touch of Oak Pinotage is a wine made for enjoying now but the standard Rijk’s Pinotage ages well. Checking my records I find I have been drinking Rijk’s 4 – 6 years after vintage and they have been perfect -- but I’ve none left now.